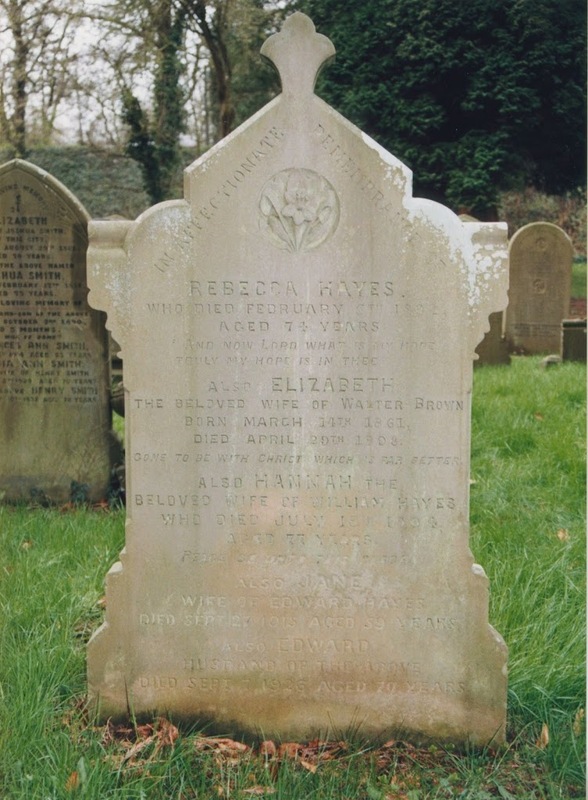 I found this headstone early on in my family history research, it was a great find as it opened lots of other doors and enabled me to discover much more information about my HAYES line. The data which led me to the headstone was on a microfilm held by the now defunct Chester Record Office (now part of the Cheshire Record Office). I spent hours perusing these microfilm records extracting likely candidates for matches to my then small family tree. Now a days you can easily search the Overleigh Cemetry records on-line! The details of the 5!! people interned in this particular grave can be found HERE. The MMI (Monumental Inscription) for this headstone indicates that there are in fact 6 people buried in this grave and NOT 5 as suggested by the on-line database. ALWAYS check the Primary Source! The sixth person details are on the reverse side of the headstone. ALWAYS check the back of a headstone. There was also a small memorial stone hidden behind the main headstone, this gave some more valuable information on another HAYES ancestor. The sixth person does in fact appear in the online database but is recorded as being interned in grave number 8000 (the R is missing). Below is the information that I recorded from the original microfilm. As you can see there is information here that has not made it to the online data, that is, the name of purchaser and the date they purchased it. ALWAYS check the Secondary source. You never know what goodies lurk in the old microfilmed resources. Just to finish off this post here is the full MMI.